I've joked for years that a Real Serving Size is the recommended serving size multiplied by 1.5. Two cookies you say? You will not be satisfied by less than three. Eight ounces of soda? There's a reason they switched to twelve ounce bottles. It's not even a joke anymore, really. I've retired it. It is now simply a fact of existence. Yet I still seem to hold to the percent daily values on my foodstuffs. Calcium still has a recommended dosage, even if a fat American wouldn't be sated by the paltry sum of matter bequeathing it. It was even in attempt to follow these guidelines that I discovered the reason my nutritional intake a few years back wasn't helping my attempt to build muscle: I was getting close to 100% of most vitamins and 200% of my protein, but only consuming 1700 calories on average; I was literally too full of food mass to fit in more for the calories. I had to add back sugars and fats. Though I try now to maintain a balanced if not numerically happy diet. Moderation and mild indulgence. That sort of thing. So I'll allow myself, to dabble in experiments. I haven't touched that 327% sodium "Jimmy Dean Breakfast Bowl" since college, but I'll try an organic energy shot I find in Mrs. Green's. Yummy looking. Actually, it tastes like weak, strained cough syrup. Utterly horrifying. I think perhaps wheat grass juice constitutes a major portion of the product. But at least it's full of vitamins! If you don't feel like click-to-enlarge-ing, that is 15 calories and 4g of sugar for 333% your Vitamin C, 300% your D (I already had 250% for my day per doctor's orders), 75% Niacin, 100% B6 and Folate, 13% Zinc, 143% Selenium (pretty sure this is what killed the aliens in Evolution with David Duchovny), and 100% Chromium. Oh, yeah, and 33,333% B12. Yes. Recount. Five threes in that one. Comma isn't in the wrong place. 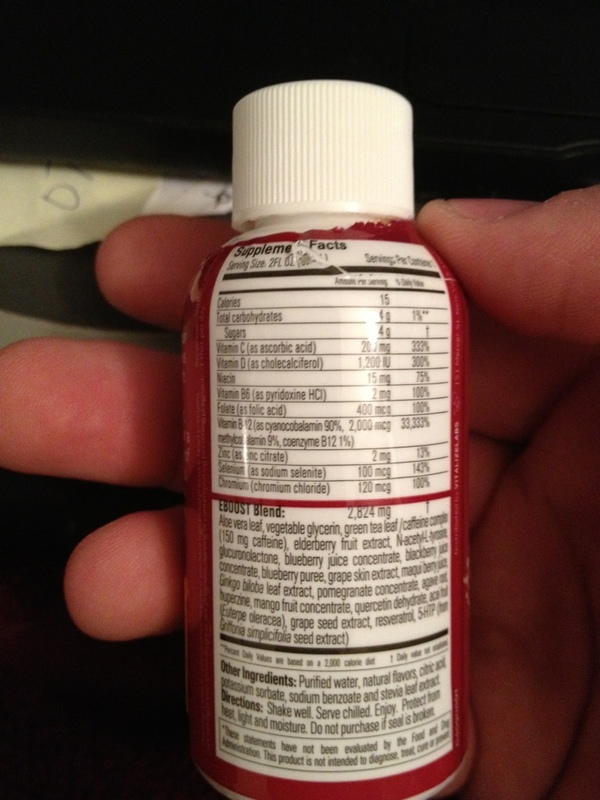 One giant B12 shot right to your gut. So fine, it tastes atrocious. At least it's healthy and gives you energy, right? As expected, nope. Not at all. Nada. Zilch. No hyperactivity, no even moderate activity. Just normal activity at best. 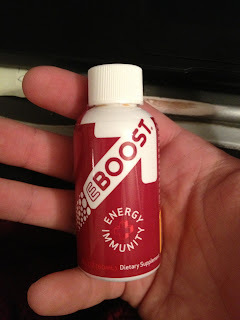 So EBoost organic energy drink: complete failure. But at least I shouldn't worry about whether I got enough nutrients while getting over my cold.